Cut the delivery costs by buying everything you need in one big order, with free delivery on orders over £50. Where do I use my Marks and Spencer voucher code? Select the discount code you wish to use and copy it. Follow the link to the Marks and Spencer website. Grab your goodies and put them in your basket at Marks and Spencer. Click on “View your Bag”. Select whether you want to reserve for in store collection or purchase for home delivery. For home delivery, you’ll be asked to sign into your account. Fill in all your delivery details and make sure you copy and paste your promotion code into the box below payment details to make your savings. "Every online purchase at Marks and Spencer is eligible for free Click & Collect and there's no minimum spend required, so there’s no need to spend extra on delivery costs." "Check the M&S online offers page that lists deals and offers for every department, these often include multi-buys, so it's worth checking if you need to buy more than one of something." "Sign up to the M&S newsletter and hear about all the latest promotions, sales and deals at M&S first." Marks and Spencer cater for every member of your family, as well as your home, with their fantastic range of men’s, women’s and children’s clothing and shoes, not to mention their superb home range, food section, and gift shop! From lingerie to formal wear, M&S are continuously upping the fashion stakes with sophisticated new looks to keep your wardrobe looking fresh each season. And, it’s not just your wardrobe that needs taking care of, M&S also supply an immense range of food and kitchen essentials that ooze nothing but good quality. You can even discover style & living, a destination for ideas, inspiration and advice for you, your family and your home in the Inspire Me section on the homepage. Best known for providing for the whole family, Marks and Spencer know that being a parent and homeowner can be difficult, which is why they supply everything you could need from school uniforms to bedding and even low-cost bottles of wine all in one place. 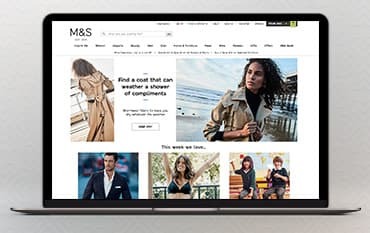 Whether it’s clothing for the kids, made to measure, high-quality lingerie, or affordable groceries and treats for special occasions like Christmas - you can find it all on the M&S website. Whether it’s sophisticated workwear, the trendiest jeans, kids pyjamas or the best fitting lingerie, you can find stylish, good quality clothing for all the family at M&S. Keep warm in the winter with super soft cashmere jumpers, shop the Autograph range for elegant everyday wear and don’t forget to visit the lingerie section that offers bras for all women of all sizes including post surgery and maternity bras. For years M&S have been boycotting the reign of the ill-fitting bra, helping women across the country find comfort and style in their lingerie drawer for less. From young to old, Marks and Spencer have it all, whether you're a young girl looking for your first training bra or a mature woman looking for the perfect combination of comfort and style. Take a look at the great selection of lingerie available on the M&S website as well as a stylish variety of clothing that’s updated every season. Not only does Marks and Spencer have you covered when it comes to everyday groceries and food it is also your ultimate accomplice when hosting dinner parties, business suppers, and special occasions. From delectable finger food to top quality 3-course meals, with all the trimmings included, the Marks & Spencer Food to Order range is guaranteed to delight you and your guests. Find beautifully decorated cakes for birthdays, weddings and parties, all the essentials for a spot of afternoon tea as well as everything you could need for Christmas dinner and dinner parties. There’s even a great selection of diet specific foods in the health section, so you can always find the food you want with ingredients suited to you. All you have to do is choose your products, place your order and wait for your food delivery. £3.99 Next day home delivery - order up until 10pm. Clothing, home and beauty items only. Free standard home delivery on orders over £50 - get your clothing, home, beauty and wine order within 3-5 working days. Free nominated day delivery on wine orders over £100 - simply select the nominated day delivery option and your chosen date at checkout. Next day delivery is available when you order before 7pm. You can also order clothing, beauty and homeware online and Marks and Spencer will deliver to your chosen store for Free for Click & Collect. Find full delivery details here. Marks and Spencer’s returns policy entitle you to refund or exchange for an item bought online or in store with a valid receipt or parcel summary document within 35 days of purchase or receipt, excluding sale items. Find full returns details here. Enter a postcode, street name or town to find your nearest M&S and its opening times. You can do this here with the Marks and Spencer store locator. Find all other customer service contact details. M&S is a leading UK homeware, fashion, and food retailer. By using a M&S voucher code you can save money on womenswear, lingerie, menswear, kidswear, homeware, furniture, gifts, and food. Whether you want to redecorate your house, update your wardrobe or just treat yourself to a slap up dinner M&S is the place for you. From Women's Skirts, Dresses, Coats and Lingerie to Men's Suits, Shirts, and Trousers - there is a great selection of items to peruse and choose from to ensure a great buying experience from a well-known brand. We are constantly on the hunt for first order Voucher Codes for Marks and Spencer to help you with your money saving. Our experts check dozens of sites for secret codes including NHS discounts, student sites & social media channels saving you time & money!